The purpose of this tutorial is to teach users about the core features of Reveal Chromatography. Much more can be learned about these features in the User manual and we strongly encourage users to read that document when they wish to begin using this software with their own data. Here, pre-loaded data will be used to demonstrate how Reveal Chromatography’s tools can assist in the process of model calibration. 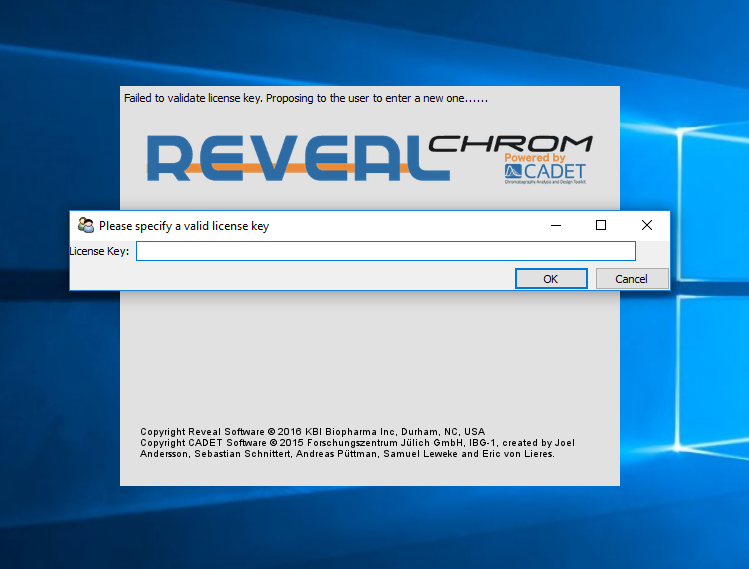 To begin, if this step has not already been completed, please refer to Downloading and (Un)Installing to download and install Reveal Chromatography. To obtain a license key, please Contact us. Otherwise, type in the license key, and click OK. The application will remember this key until the license expires. The user data browser displays study-independent parameters, and is where the user defines the properties of the components of the system they will use to build a study. 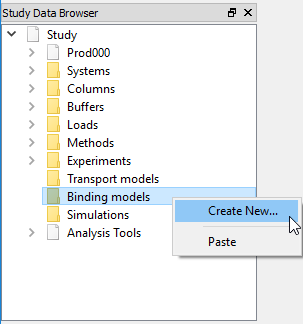 These include the properties for products, resins, columns, etc..
To complement the User Data browser, the study data browser contains study-dependent data elements, simulation tools, and analysis tools. These data elements include study-specific buffers, purification method descriptions, binding models, transport models, as well as experiments and simulations made from these elements. The central pane is where details about elements from the User and Study data browsers will be displayed when double-clicked. Each element will open in its own separate tab. In addition, the central pane is the area where chromatograms and other plots open, and the area where results from the analysis tools (e.g., parameter explorations, optimizers) will be displayed. Finally, the performance parameters pane will display the performance parameter results for simulations once they have been run (e.g., yield, purity, etc.). Reveal Chromatography comes pre-loaded with a templated input file containing experimental chromatography data that can be used to calibrate a model for the sample product, called PROD000 . That product was analyzed with Cation Exchange high precision chromaography and was made of 3 isoforms: Acidic 1 , Acidic 2 and Native . Users can learn more about using their own data and products by referring to Next steps: Modeling your own protein at the end of this tutorial. To open the sample data to be used in this tutorial, select Show sample input files... in the Help menu. To make it easier to find this data again, it is recommended that users copy the data files to their Desktop. Input data for Reveal Chromatography is made of a required Excel file ( .xlsx ) and optionally a set of supporting files ( .asc or .csv ) containing chromatography-related continuous data exported from chromatography equipment (e.g., AKTA). 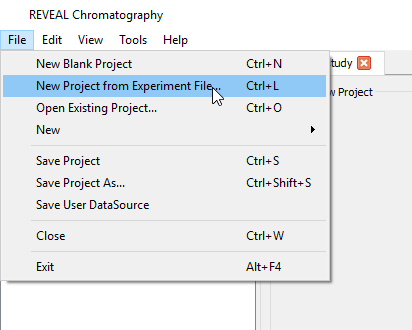 To illustrate the features of Reveal Chromatography, this tutorial will utilize data contained in Example_Gradient_Elution_Study.xlsx, and its companion AKTA file Example_AKTA_Data.asc. These sample input files can be found and downloaded again at any time from this link . For more details about the precise structure of this input file, refer to the user manual’s Preparing experiment input files section. To begin using Reveal Chromatography to analyze the example data, create a new project around the previously referenced sample input file. To do so, select File > New Project from Experiment File... (or ctrl-L). 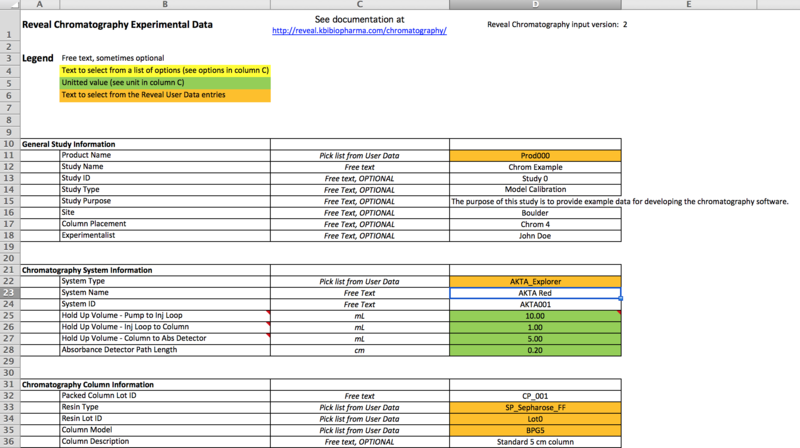 The default dataset types that Reveal Chromatography detects are accurate. For the sake of brevity, we will assume that the default time of origin settings are accurate too. For more on this, refer to the user manual’s Parsing the AKTA files. To learn more about the chromatogram plot features, please refer to the Exploring the chromatogram section of the user manual. Learn more about controlling the settings during loading of the .asc or .csv file in the Continuous data section of the user manual. Once experimental data about a product has been loaded, users can simulate the chromatography process and calibrate how the product components transport through the column and bind to the resin beads. This is done in Reveal Chromatography by creating a simulation around the experiment’s method, and assuming a transport model and a binding model. 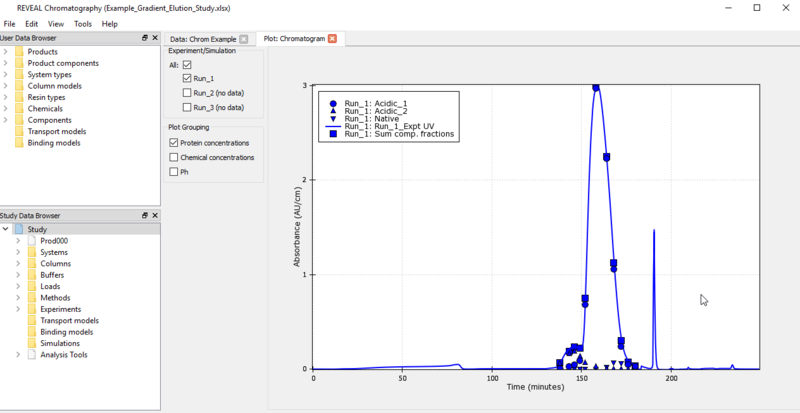 Comparing the simulation’s chromatogram to the chromatogram produced by the experimental data allows users to evaluate the accuracy of the chosen transport and binding models. The process of building realistic estimates of these parameters is beyond the scope of this tutorial, though interested users can refer to the literature for additional guidance. For now, assume that the default values for these parameters are an acceptable starting point and click OK.
At this point there should be at least one transport and at least one binding model in the Study Data browser. 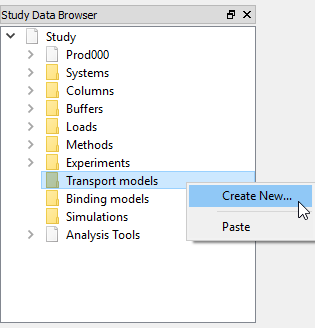 This can be checked by expanding the Transport models and Binding models sections of the Study Data browser to make sure that they each contain an element. Then, double-click on these models to review their values. If these models are present and correct, then all of the necessary components for building a simulation are present. Now double-click on the simulation to view its parameters and components in the central pane. 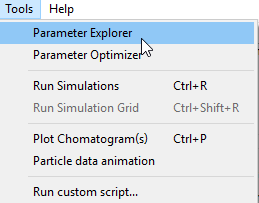 Note that the new simulation has been added to the performance parameters pane. However, all performance metrics will remain blank until the simulation is run. 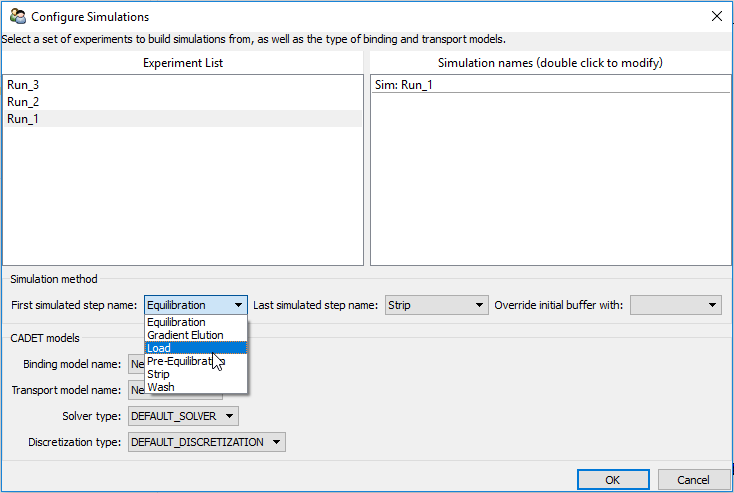 You can create multiple simulations by selecting multiple experiments from which to create them, as long as they all share the same first and last step, as well as the same binding and transport models. The simulation will take a few seconds to run in the background, and once completed, will update its status in the central pane and trigger an update of the performance parameters pane. Users may also produce a chromatogram from simulated data by clicking on the graphing icon, located in the upper left hand corner of their screen. Users can hide the controls on the left hand side of the screen by clicking on the controls icon (pictured below), located in the upper left hand section of the open window. Users can also hide the legend that appears on the chromatogram by clicking on the legend icon located to the right of the controls icon. This chromatogram indicates that the simulation is a poor representation of the experimental chromatography process. This is not surprising considering the assumption made above that all default transport and binding model parameters were an accurate description of the PROD000 product. The mismatched chromatograms indicate that this assumption is faulty. It seems logical to next explore how modifying certain parameters might affect these chromatograms. This can be done most efficiently by creating, running and plotting batches of simulations where one or more parameters vary, which is the topic of the next section. Reveal Chromatography can be used to create multiple simulations to study the effect of modifying one or more parameters at once. 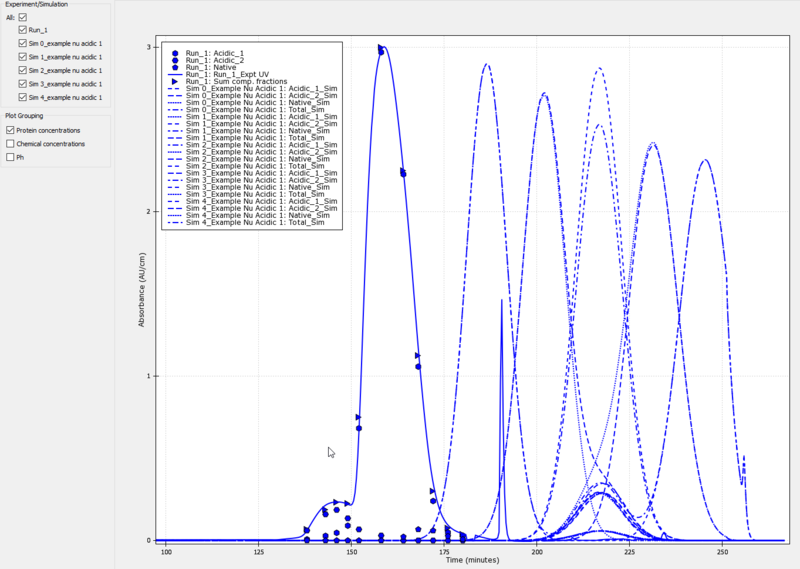 It can help users explore the effects of modifying these parameters on chromatography processes, as well as the effects on the resulting chromatograms using the Parameter Explorer . The Parameter Explorer allows users to create a grid of simulation results around an existing simulation, called the grid’s “center point”. The newly created grid represents simulations where every parameter except one is identical to that of the center point. 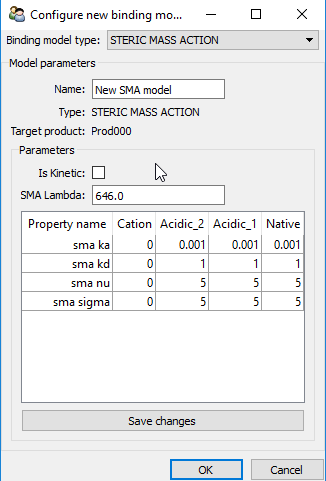 In this demonstration, the Parameter Explorer will be used to understand the effect of the SMA binding model’s characteristic charge (denoted sma_nu) for the main product component ( Acidic 1 ). sma_nu represents the number of binding sites that the protein component can access, which will have a direct impact on the time at which that component elutes. The “center point simulation”, which is the simulation around which to build the grid. Since there is currently only one simulation in this tutorial’s study, there is only 1 possible choice there. To scan the sma_nu binding model parameter for the second product component, sma_nu should be selected as the scanned parameter name. 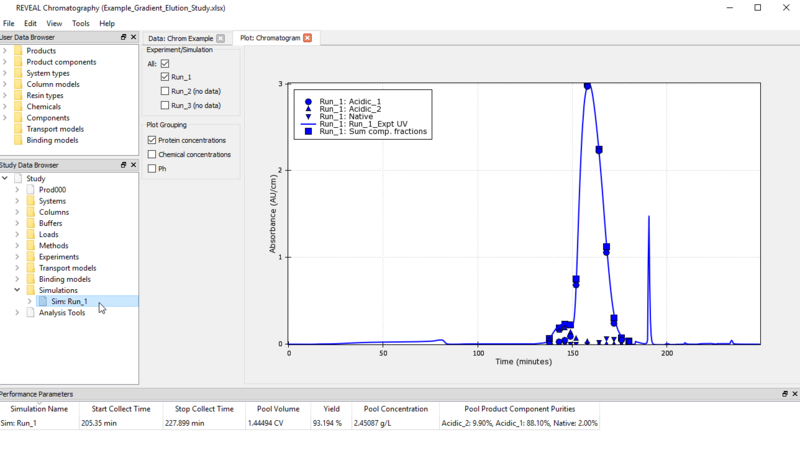 Once selected, Reveal Chromatography will automatically display the value of the parameter from the current simulation. Specify the range of values to be scanned by double-clicking the cells in the Low and High columns. Since the current simulation has a sma_nu=5 as a center value, values between 4.0 and 6.0 seem reasonable. Additionally, the Num values field can be used to specify how many simulations involving different values of the parameter being scanned should be produced. Use the Spacing field to select whether you would like a logarithmic or linear scan. To keep the run time relatively short in this tutorial, it is wise to make a coarse grid by keeping Num values at 5.0 , and the spacing as linear since the values scanned are all of the same order of magnitude. Press OK. The simulation grid will automatically open in the central pane. The newly created grid can also be located in the Study Data browser, by navigating to Analysis Tools > Simulation grids. To locate this grid in the Study Data browser, navigate to Analysis Tools > Simulation grids and select the appropriate grid. 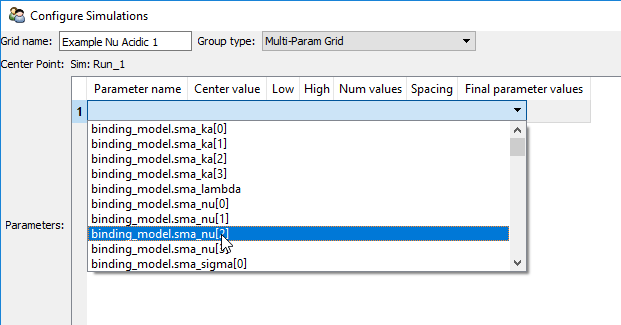 For more detailed information on how grids are build and how to build more complex ones, see Exploring the parameter space: Simulation Groups. The simulation grid in the central pane will display the number of simulations the grid contains, and the name of the simulation at its center. The central pane also displays a table made to display some performance data for each of the simulations in the grid. The table will eventually display performance data related to pool concentration, pool volume, and component purities. Upon creation, this table has no values, since the simulation has not yet been run. To run the CADET solver on all simulations in the grid, click the Run Simulation Grid button in the grid’s view in the central pane. 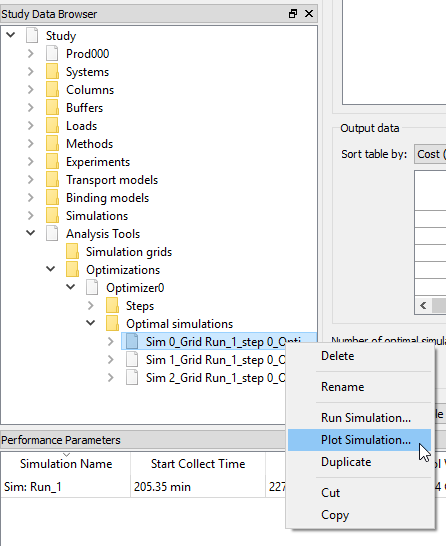 As the simulations run, the grid’s performance data table will begin to populate with updated values. Once the grid has fully run, the performance table will be full, and the status will go from Running... to Finished running . The dashed peaks from right to left correspond to all grid simulations with sma_nu values of 6.0 , 5.5 , 5.0 , 4.5 and 4.0 respectively. The pattern of these peaks confirm that lower values of nu result in shorter elution times, and therefore closer alignment with the experimental data (displayed as a solid line). To learn more about how to save these simulations once they have been run, visit the user manual’s Saving your work section. 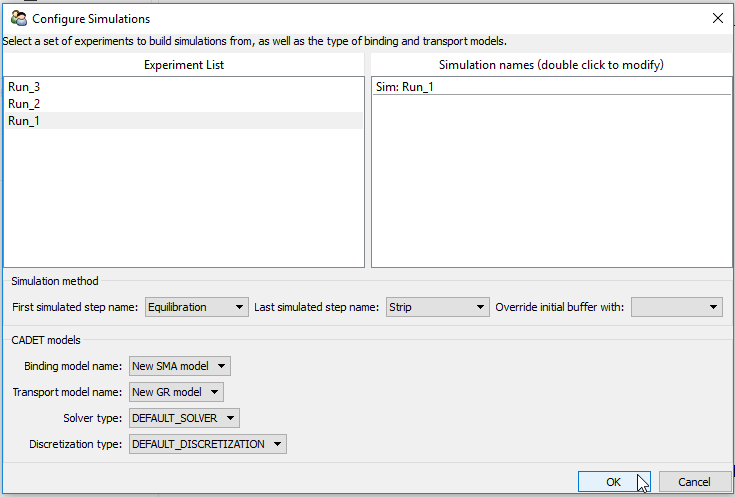 As a review, the Parameter Explorer has shown that (assuming all other parameters are correct) a value of sma_nu smaller than 5.0 is needed to account for the experimental data. The plots indicate that values below 4.0 should be explored. This can be accomplished by running another simulation grid that explores sma_nu values, say from 1.0 to 4.0 . 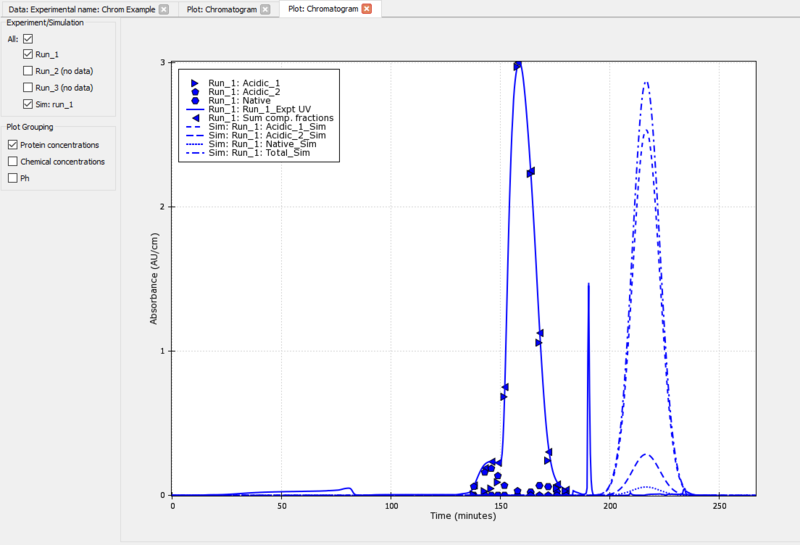 This is one possible workflow that Reveal Chromatography offers to calibrate a model: create a grid, run and plot all simulations, compare the resulting chromatograms to the experiment(s), and repeat. Although much can be learned from this workflow, an additional tool in the software automates it by creating a simulation grid and automatically sorting each of the simulations by how well they match the experimental data. This additional tool, called the Parameter Optimizer , is described in the next and final section of this tutorial. 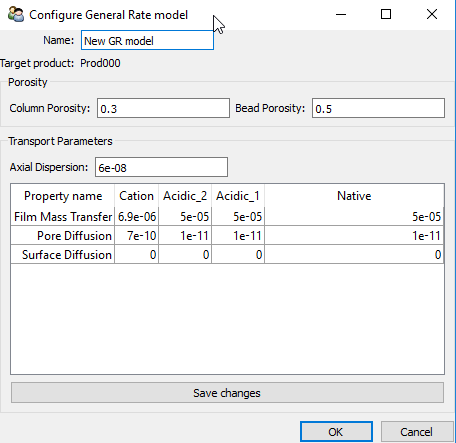 The Parameter Optimizer is used to scan and calibrate parameters (from the binding model, transport model, operational parameters, etc.) while also comparing the simulated chromatograms to the target experimental data that users would like to calibrate these chromatograms against. 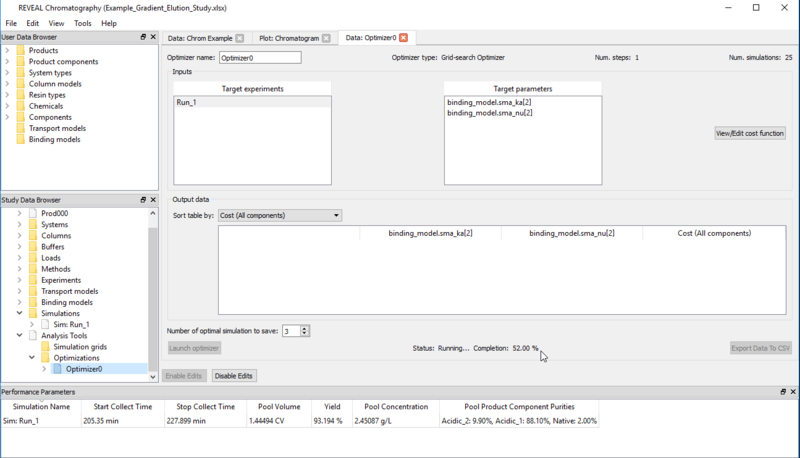 The Parameter Optimizer tool allows users to minimize a “cost function”, which measures the alignment between a simulated chromatogram and an experimental chromatogram. 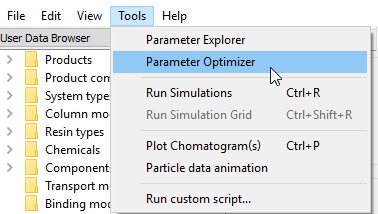 Within the Parameter Optimizer, there are currently two types of optimizers that can be selected. The default is the most general and implements the simplest grid search-based algorithm. 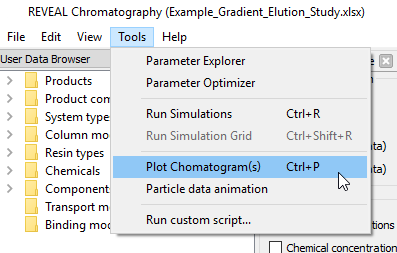 The idea is to define a set of parameters to scan, create and run all simulations in that grid, and compute the cost (or distance) between the resulting chromatograms and the experimental data, a workflow that was done more subjectively when using the Parameter Explorer tool, as described above. A new window will open to select experimental data against which the output simulations will be compared. Again, as Run_1 is the ony run with data, select Run_1. It is possible to optimize some parameters across more than one experiment. 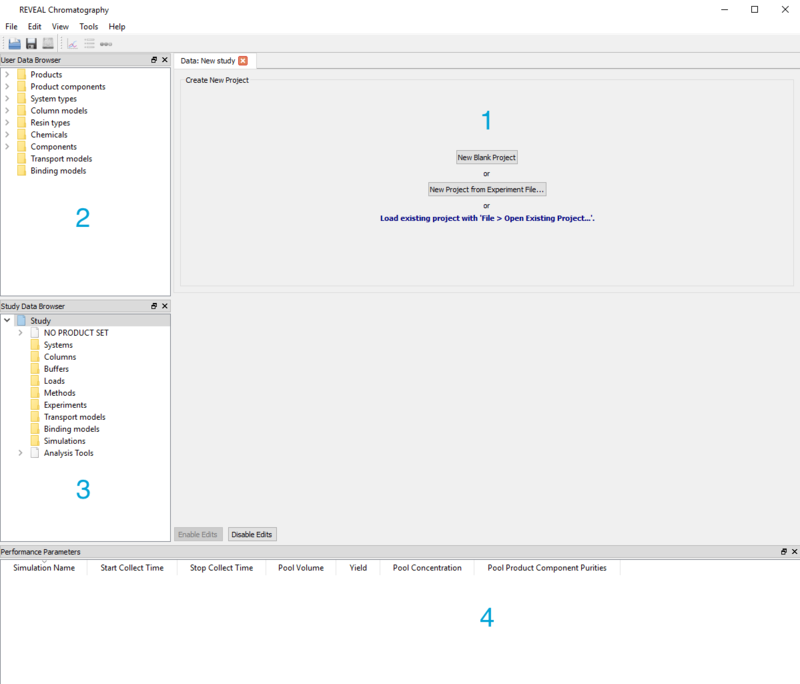 Select multiple experiments by holding down the Shift key while clicking on each experiment. 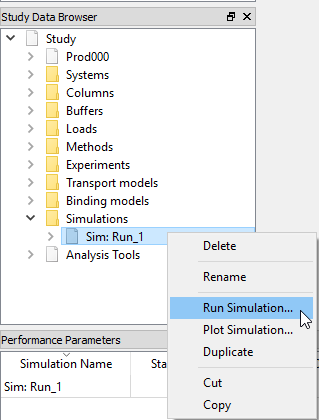 Next, specify a starting simulation from the drop down menu. Then, select the New parameter scan button to choose which parameters will be optimized. In the previous sections, it was observed that the binding model’s sma_nu could be explored further. Additionally, the plot generated in Plotting the grid indicated that this parameter might be explored below 4.0 , so it makes sense to scan sma_nu between 1.0 and 4.0 . It is recommended that users leave the Override initial buffer with field as blank, just as was done in the creation of a simulation, so the initial buffer is read off the experiment’s method (see ). Click Create to create the optimization. The newly created optimizer will automatically open in the central pane. It is also available in the study data browser, under the Analysis Tools > Optimizations section. 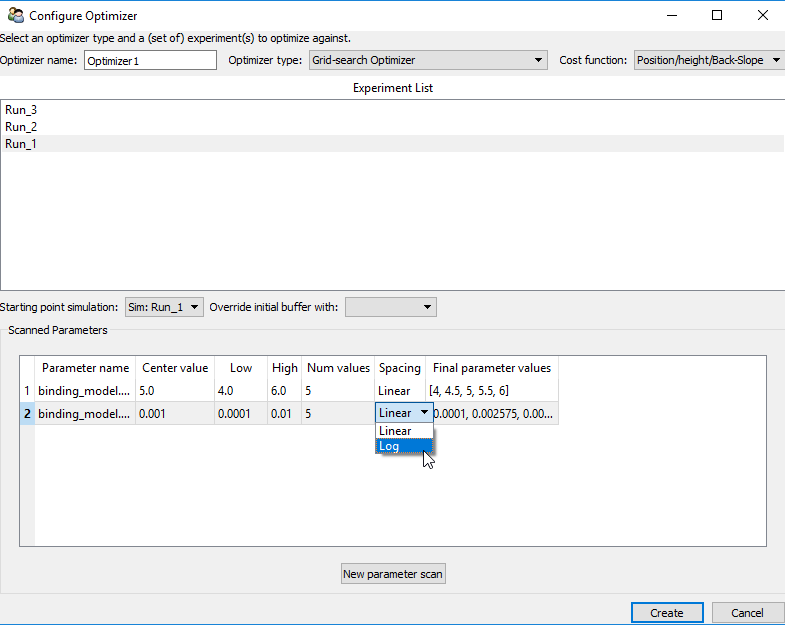 The newly created optimizer’s central pane view displays the target experiment, the list of parameters that will be explored, the total number of simulations that will be run ( 25 if scanning two parameters, with five values each). 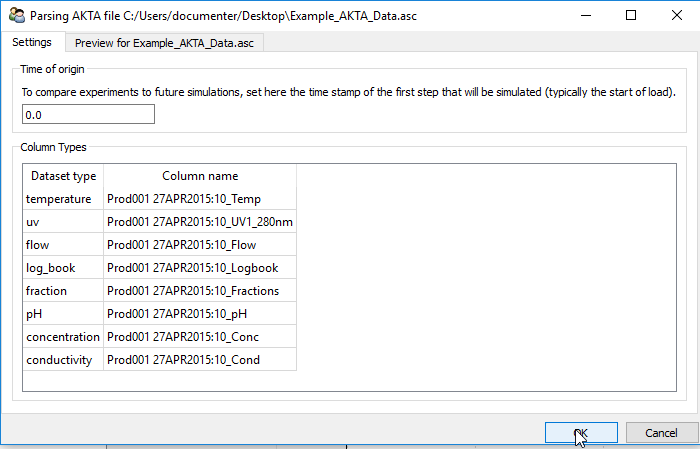 Below, there will be a table which will display output data that will be collected during the optimization (values of scanned parameters, and total cost of the resulting simulation). 1. A decent match was obtained for one of the product components ( Acidic 1 ), but the other species are still eluting too late. In addition, optimal parameters for each component may influence all other components. Therefore, parameter values for all components should be optimized at once. 2. The experimental data was loaded without applying any time shift when we loaded the AKTA file (refer back to Loading experimental data into a new project). Consequently, the experimental data is displayed with time starting at the pre-equilibration step, whereas simulations are defined starting at the Load step. So the apparent match is completely fortuitous. 3. Calibrating a chromatographic model requires that users be able to fit experimental chromatograms from multiple operational conditions, like a different flow rate, a different gradient elution slope, a different pH, etc. This optimization task has moved towards a model that fits one experiment, but it is highly unlikely to remain predictive when tested under other conditions. This is why Reveal Chromatography’s Optimizer also supports fitting more than one experiment at a time. See the section on Parameter optimizers for more details. 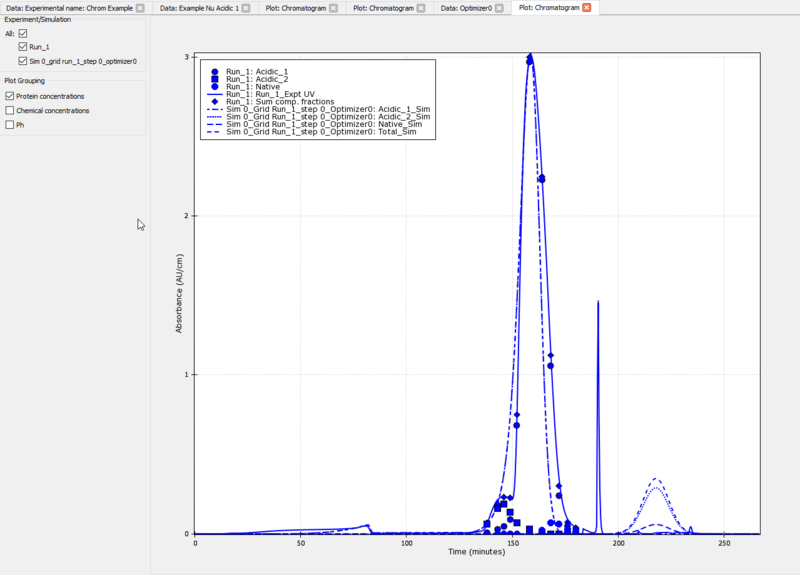 This tutorial illustrated a simple calibration task with the goal of showing users the tools which Reveal Chromatography contains. However, the actual practice of calibrating models requires much more effort. More details about calibration will be published by KBI soon. In the meanwhile, please Contact us if you have questions. Or, users may start at the beginning of the User manual.